A bit about the history of this spot: starting in the early 1990’s, this building was known as the Phun Phactory, and curated by a man named Pat DiLillo. A dispute with the landlord ended that project, and without anyone to cultivate the art on the walls, the building got bombed with tags and the overall quality went way down. 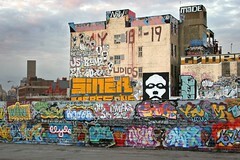 In 2002, local writer Meres approached the landlord with the new project, and 5 Pointz, the Institute of Higher Burnin’, was born. People paint there now only with Meres’ permission, and hundreds of writers have contributed their pieces to bring the building up to a whole new level. I spent a few hours wandering around the place and documented it as well as I could. I took a few hundred photos, which was not nearly enough, but you can see some of them here. I encountered two groups of people shooting video projects, and at least five different writers midway through painting pieces as I strolled through the space. I also got to see Meres himself in action, teaching technique to some young aspiring writers, coordinating the new work going up, and even taking the time to demonstrate the basics of style for the tourists. The man’s dedication and patience were impressive. Someone please remove this man’s thumbs before he hurts somebody. November 3, 2005 on 11:48 pm | In global news | Comments Off on Someone please remove this man’s thumbs before he hurts somebody. Apparently the mayor of Las Vegas has forgotten about that whole “cruel and inhuman punishment” thing in, what’s it called? Oh yeah: the U.S. Constitution. Or maybe he’s just hoping to get promoted into the neocons’ White House. I hear they’re big fans of torture there. Update: Wooster Collective wants your thumbs! 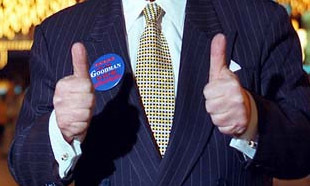 Update 2: According to Visual Resistance, this Goodman guy has connections to organized crime. Interesting article on the Reuters feed about graffiti in the wake of the hurricanes in New Orleans: New Orleans dotted with the graffiti of disaster. A can of spray paint was a crucial tool for New Orleans rescue teams marking buildings in the search for survivors after Hurricane Katrina. Seven weeks later, the homespun graffiti is spelling out another kind of message. “FEMA, where y’at?” reads the writing on a toppled column in the median of a deserted street in St. Bernard Parish, where residents remain bitter about the slow federal response to the flooding and winds that flattened homes and flipped cars.